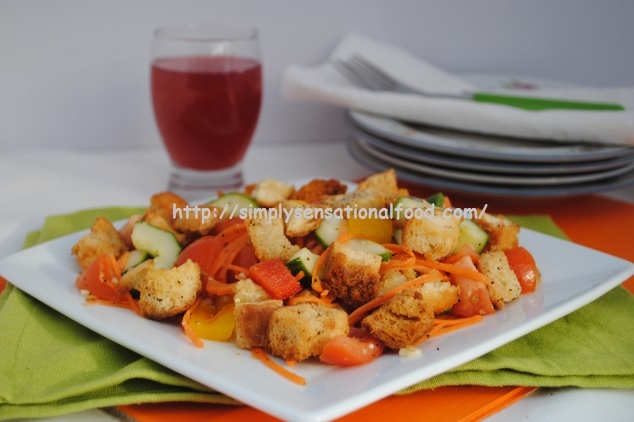 My assigned blog was Eat Laugh love .The blog writer Denise has a lovely selection of recipes and I immediately fell in love with this Gazpacho Summer salad recipe. I recreated the recipe with a few minor changes. 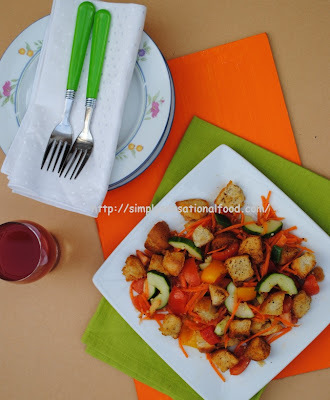 Colourful and vibrant summer salad with a tangy and aromatic dressing. 1.Cut the bread rolls into small inch pieces and put them into a bowl, drizzle some garlic infused olive oil and add salt and pepper. 2.Toss the bread cubes and transfer them to a baking tray and bake in a preheated oven 180 degrees C / 375 degrees F for ten minutes until golden brown and crispy. 3.In another bowl add the tomatoes, cucumber,peppers,lettuce and carrots and toss together. 4. In a screw top jar, add all the ingredients for the vinaigrette and mix well. 5. Pour this vinaigrette over the mixed salad and toss well. 6.Add the toasted bread cubes to the salad and toss again. 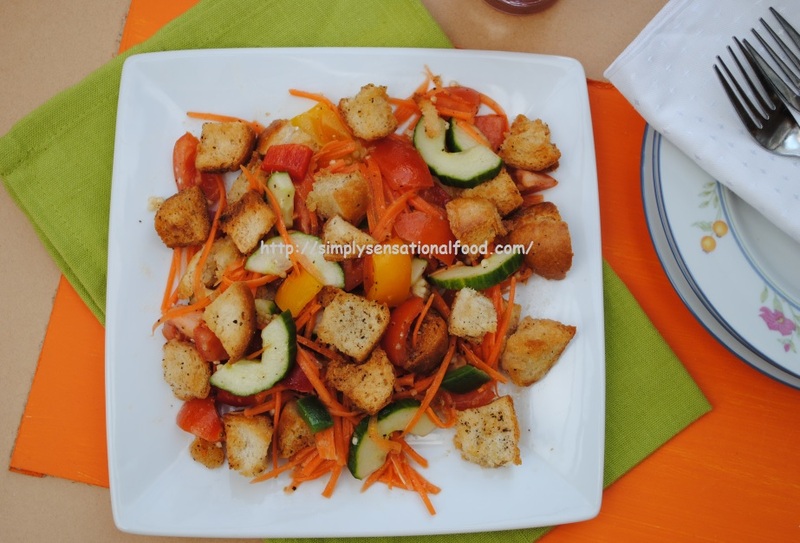 fantastic salad for the indian summers Nayana! WOW ...what a colourful salad .. Such a wonderful salad! I can't wait for the summer tomatoes to arrive so I cam make this! Glad you enjoyed it - easy and pretty. Nice being in SRC with you. What a delicious looking salad! Looks sooooo fresh and delicious! What a refreshing salad! What a great recipe and looks super tasty. Glad to be part of SRC group C with you! This certainly has me anticipating summer! Your dish looks and sounds incredibly tasty. Glad to be part of SRC group C with you! This salad looks so light and refreshing- perfect for spring and summer. It would be great as a main dish with some chilled shrimp. Oh this is brilliant - I have a feeling I'm going to be making this one all summer long with all the glorious vegetables that will be in season! Happy SRC reveal from a group C member!! Great salad. Like the idea of making the croutons yourself. Giveaway ~ Free tickets to Grand Designs Live.